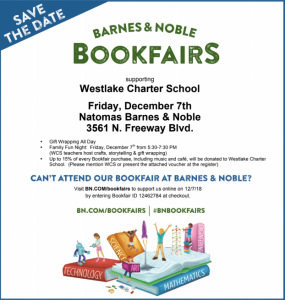 Our annual Barnes & Noble Bookfair and Family Night will be on Friday, December 7th. Purchase books all day in store at 3561 N. Freeway Blvd. and online. Come visit the store from 5:30 – 7:30 with for gift wrapping, read alouds by Westlake staff and a holiday craft. If you would like to support the school by volunteering to gift wrap during the day on December 7th, please click HERE.